Skira, Hardcover. 272 pages. Gold held a deep symbolic meaning for the pre-Hispanic cultures of present-day Colombia. Its color and brilliance made it analogous with the Sun and a powerful symbol of fertility. Its physical and chemical properties allowed for the creation of different textures and a variety of color tones that became part of the political and ritual functions of the objects produced. They manufactured simple objects used by ordinary members of the community, such as nose rings, earrings, breastplates, pendants and tools, as well as complex showy objects including body adornments, emblems of rank and power, and votive figures reserved for important figures such as governors, shaman and venerable elders. 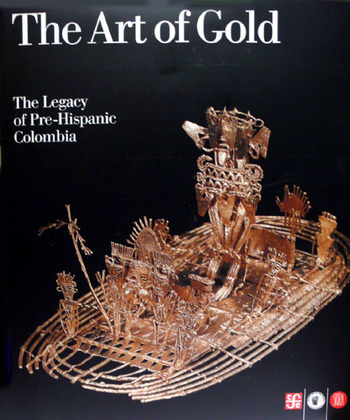 This richly illustrated volume traces the legacy of gold in pre-Hispanic Colombia in over 250 exceptional gold objects, supplemented by maps, diagrams, and illustrations that put in context the pieces that make up this extraordinary collection from the Gold Museum of Bogot. The exceptional photographs are accompanied by brief descriptions of the cultures that created the objects, their customs, the territories they occupied, the techniques used and the symbolic value assigned to the different pieces.